Quaint and private, the Seaside Cottages are perfect for a romantic getaway or when you need a few days secluded from life's busy schedule. White Bay Villas features three identical Seaside Cottages, closest to the ocean and beach. These cottages are hugely popular, as they are nestled, cozy, and surrounded by tropical foliage which we have maintained so you can enjoy the incredible views of White Bay and the Caribbean. Each cottage features a full kitchen, ceiling fan, tile floors, gas oven/stove, microwave, blender, full-sized fridge/freezer, excellent cutlery, spice rack, cutting boards, all flatware, dishes, glassware, coffee maker, and French press. In the living/dining room, there is a custom built-in café table, ceiling fan, flat-screen TV, stereo, telephone, and high speed wireless internet. Also in the living room is a custom built couch with one-piece firm cushion that may be used as a daybed. Each of the cottages' bedrooms have a queen sized bed, ceiling fan, and air conditioning. On the porch, you will find a café table, ceiling fan, hanging swing chair or hammock. The porch is the perfect place to watch the sun set over the sea or mountain to the west and watch the morning glow illuminate White Bay. Each cottage has its own BBQ grill. "We’ve always wanted to stay at these cottages. 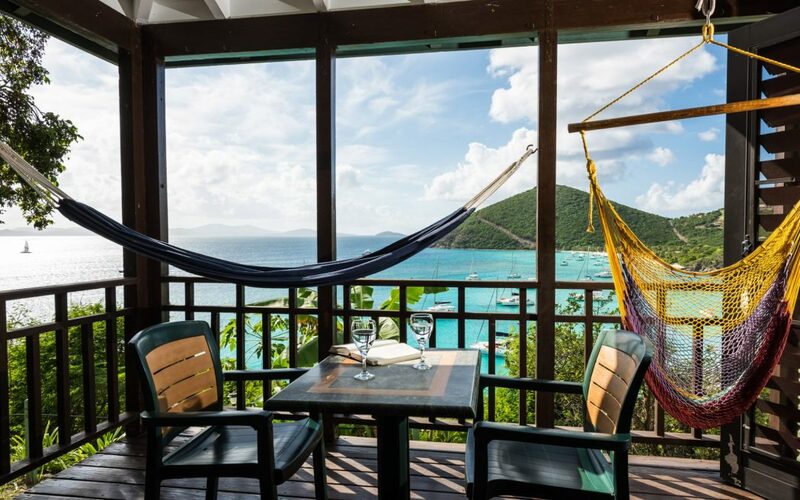 We left our timeshare in St Thomas empty for one night to make it finally happen. Our Seaside Cottage had all the comforts of home! It exceeded my expectation of clean! Fully stocked kitchen, beach and bath towels, WiFi, and the most amazing views of our favorite beach."